Home Costs > How Much Do LED Bulbs Cost? A LED light bulb uses less power compared to the traditional CFLs, and on average, a LED light bulb can generate twice as many lumens as a CFL. Environmentalists recommend LED bulbs because these bulbs are less likely to land in a landfill, it doesn’t have to be changed frequently, it reduces fire hazards, and uses less gas emissions from the local power plants. The cost of a LED bulb will depend on the size of the bulb, how many watts it produces and the store you purchase from. How much does an LED bulb cost? On average, a LED light bulb can cost anywhere from $3 to $10 per bulb. While most bulbs come in a single pack, there are multi-packs that contain more than two bulbs. This will all depend on the brand. In the end, plan on spending about $8 or less for a high-quality brand name LED bulb. A smart LED light, which allows you to control it from your Wifi, can cost anywhere from $20 to $45. Aside from the typical white color we’re used to seeing from a light bulb, LED lights can also display an array of colors, ranging from purple to red. Color changing bulbs, if you were to consider purchasing, often cost about $12 to $17 per bulb. Most color changing LED lights will even come with a remote that allows you to pick out which color you want to display. Walmart, for example, has a few single packs for sale that retail for $10 or less. A 40W equivalent will retail for about $5, while a dimmable 85W equivalent will be double this. Green Living Ideas says the average LED retails for about $5. We researched some of the most popular LED lights searched online and included a price estimate below from most major retailers such as Lowe’s, Home Depot and Amazon. LEDs, also known as light-emitting diodes, used to be found in small electronics such as a clock or even your cable television box. 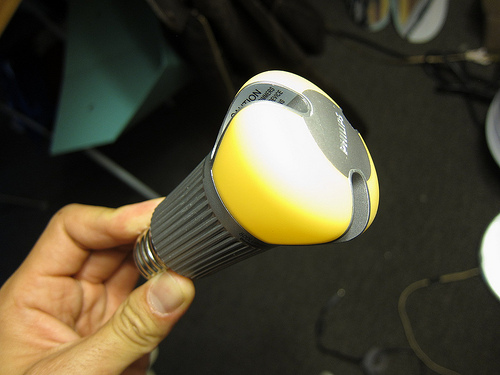 These bulbs, unlike CFL bulbs, will produce light when the current passes through. A CFL bulb, on the other hand, will conduct electricity as it flows between the two electrodes at the end of a gas-filled tube. The biggest difference between this type and a CFL is that they can last five times longer than any other bulb on the market. In fact, LED lights have a lifespan that can last up to 50,000 or more hours. The most common types of LED lights include omnidirectional, dimmable globe, track, flood reflector, flame tip and tube lighting. Some brands will offer a guarantee that their lights will last a certain amount of time. If the lights fail to meet this time frame, they will refund your money. Of course, the LED bulbs will use electricity when in use. Green Living Ideas put together showcasing what it would cost to run an LED, and they compared it to an incandescent and CFL bulb. Annually, the LEDs would cost about $0.92 per year. Compared to an incandescent that uses close to $9 annually, the savings can really add up. In fact, ENERGY STAR states it can save you up to 75 percent per year. Dimmable LED lights are going to cost more than a standard light, usually about 30 percent more on average. However, before purchasing a dimmable LED light, make sure you can use this type of bulb in your light fixture as some will only work with incandescent bulbs. Multi-color packs that enable the lights to change various colors can cost 30 percent more. Bulbs down the road will burn out just like any other bulb. Plan on replacing them every 20,000 hours or so. Pay close attention to the packaging to know the wattage equivalent. For example, a 3W will be comparable to a 45W incandescent. Also, pay close attention to the pin sockets as there several types. You may notice two terms on the market: warm and cool lighting. Warm lighting will be in reference to being used as an accent in a smaller area, while a cool light will be used for task lighting. Warm and soft lights will also produce a yellower hue, similar to an incandescent bulb, while bright lights, if labeled as such, can produce a much brighter color. The light bulbs, when compared to other types, will emit very little heat, even staying cool when you touch them. Incandescent bulbs, on the other hand, can release 90 percent of its energy. If comparing a LED to an incandescent in terms of wattage, here’s what you need to know: 150W will be equal to a LED 25-28W; 100W will be equal to a LED 16-20W; 75W will be equal to a LED 9-13W; 60W will be equal to a LED 8-12W; and 40W will be equal to a LED 6-9W. If more than one bulb has to be purchased, consider purchasing a multi-pack (also known as a value pack). Generally, the more bulbs you purchase, the more you are going to be able to save per bulb. Check local hardware stores such as Home Depot for a contractor’s pack. If you have not made the switch yet, highly consider a LED bulb as they are going to last 10 times longer than a standard CFL bulb. It is best to switch the light bulb once the older one burns out.